Yet another franchise cross over. The Jungle Lord meets the Barbarian Queen. A great introduction to what should prove to be another great meeting of the franchises. Our tale opens in the Eucalyptus Forests of Australia in 1921. A hunter named Eson Duul is stalking his prey, a Thylacine. He commands his team to take the male carcass but kill the rest. One of his party protests that they can’t just kill these cubs, they could be the last Thylacine cubs on earth. But Eson’s friend informs the safarist that when he hunts, he hunts to extinction. We cut to Hyrkania, in the Hyborian age. 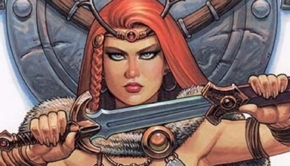 Red Sonja is in no fine mood, no fine mood at all! She’s been injured and heads to the local tavern to tend to her wound, by heating her knife and drinking! 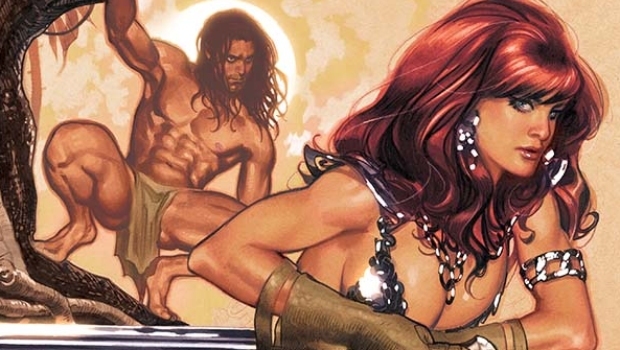 Gail Simone has the difficult task of teaming these two that were raised in the wild, but in different centuries, together without the story seeming contrived. She has the Ape Man’s first showing in this story not in the jungles of Africa, but in the sophisticated society just outside of London. He is Lord Greystoke, not a savage in a loin cloth, but a gentleman in a business suit. He arrives at Eson Duul’s home and he is none to happy. Duul has put some of his favorite animals…his friends, in cages, including the Elephant Tantor and the gorilla Mangani. Duul is also trying to take over his friend’s land. This is a great introduction to what should prove to be another great meeting of the franchises. Great stuff includes Tarzan using his vast wealth to stop a tyrant from taking over a peaceful land and Red Sonja attempting to best said tyrant, but in her own era, about a thousand years or so before Lord Greystoke time. A clever twist in a well written story. 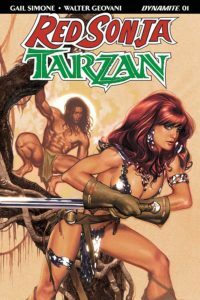 Walter Geovani seems comfortable in both eras as he brings out the tough no-nonsense attitude of our Hyborian princess, also the simmering anger that is brought to a boil in Tarzan. He can never understand how a society so privileged can resort to such cruelty and probably thinks that he had it better as a savage. 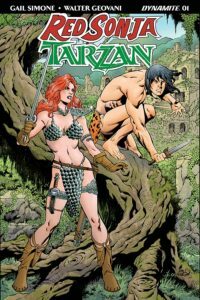 Highlights include the splash where Tarzan marches determinedly into the lair of Eson Duul and Red Sonja’s first appearance as she marches into the ancient town, with roughly the same attitude. The Mysterious Eson Duul has exerted his power in both characters times and manages to get under their skin in ways that other tyrants never have! Duul has kept his promise to release the animals from their cages, but not in a healthy way. 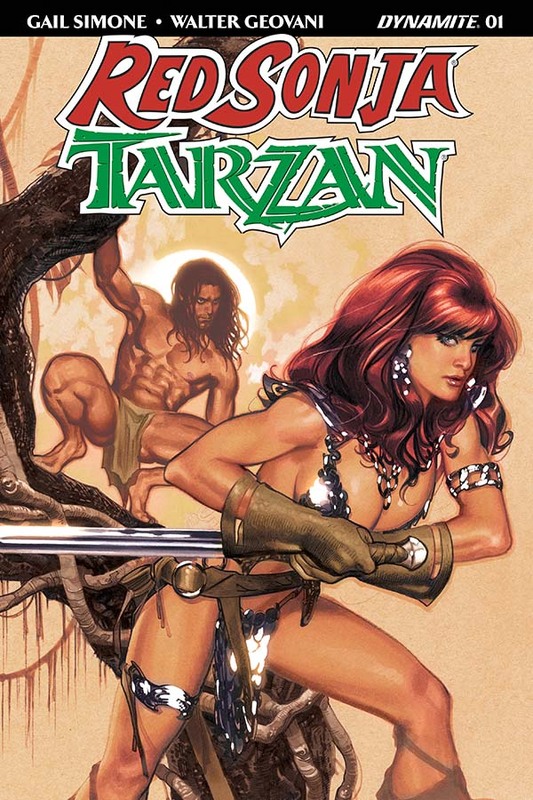 Tarzan’s anger swells and he rips out of his shirt in a rage. He meets a woman that calls her self “Sonja” and reveals something to Tarzan that fails to compare to the atrocities that he’s just witnessed… To be continued.